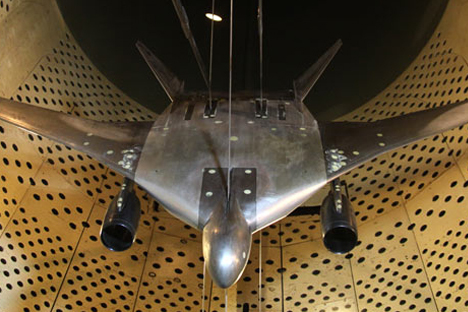 Russia is developing a new long-range bomber aircraft with a futuristic look, which will carry hypersonic missiles, and be invisible to radar. A long-range bomber aircraft now being developed in Russia will be different from earlier generations, according to The National Interest. The new aircraft will have a futuristic look, carry hypersonic missiles, and be invisible to radar. The new long-range missile carrier will have a “flying wing” profile, much like its American counterpart, the B-2 ‘Spirit’. This arrangement provides low visibility for the aircraft from radar operating at long wavelengths. The ‘PAK DA’ will be equipped with the latest modern electronic equipment, including radar, navigation, communications, and electronic warfare systems. Aiming (target) mechanisms in the ‘PAK DA’ may not be necessary, because the main weapons of this bomber will be hypersonic long-range missiles. “The main items in this system are missiles with ranges of up to 7,000 kilometres. The guidance system of each missile will independently determine when, where, how fast, and at what altitude to fly. The aircraft will be only the means to deliver the missiles to their launch area,” said Colonel-General Viktor Bondarev, Chief of Air and Space Forces of Russia. In addition to strategic missiles, the aircraft will be armed with precision weapons. The Samara-based Kuznetsov Plant has been tasked with making engines for these new bombers. The base for these engines is the turbojet NK-32, which are now used on the Tu-160 bombers. The dimensions of the PAK DA will be relatively large, says Dave Majumdar, military analyst at The National Interest. The maximum takeoff weight will be 110 tons (B-2 – 171 tons, Tu-160 – 275 tons, of which 148 tons are fuel).The technical specifications, set by the Russian Air Force, include a range of 12,500 kilometres and payload weight of 30 tons. The B-2 ‘Spirit’ can lift up to 22 tons of bombs and missiles to the air, the Tu-160, 41 tons). This new bomber is likely to replace the existing Russian fleet of long-range bombers, which include the Tu-22 bombers, and the Tu-95 and Tu-160 missile carriers. “We are satisfied with the pace of work being carried out on the PAK DA. Our objective is to have a prototype take to the skies in 2021, but if things keep going as they are now, this milestone will be achieved even earlier,” Bondarev told reporters.